Sivritos was an important and autonomous city of the ancient Crete. The city was built in the location that today is the village of Thronos. It was located on a hill dominating the valley of Amari. The name Sivritos is derived from the words si, that in the ancient eastern languages meant water, and the word vriti, that is of prehistoric origin and meant sweet. Therefore, Sivritos in the Minoan period meant sweet water. The derivation is also verified by the fact that near the hill where the city was located there are numerous sweet water springs. Archaeological excavations have not been done yet to Sivritos. The city was in its peak mainly during the Roman period. It had its own coins (silver coins of great value today), depicting the Gods Dionysos, Hermes and Zeus. The city was well fortified and its port was ancient Soulia, today called Agia Galini. Sivritos remained an important city during the First Byzantine period and it was an episcopical seat. The city was destroyed by Saracene pirates. The ruins of the ancient city can be seen in the hill of Throniani Kefala. The village of Thronos that is built on the location of Sivritos took its name by the episcopical seat of Sivritos (Thronos in Greek meaning throne, seat). 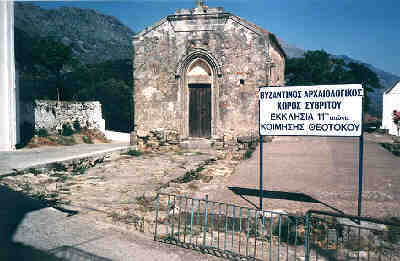 In Thronos is located a wonderful Byzantine chapel of the 11th century dedicated to the Assumption of the Holy Mother. 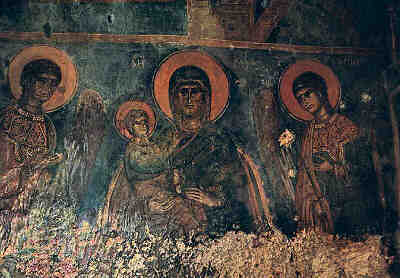 The chapel is decorated with well-preserved frescoes of fine quality and with mosaics.